The next months there will be several blog posts related to Eclipse RCP and related technologies. They will be released as part of the Eclipse Cookbook, which is intended to be a collection of recipes that help in getting started with application development based on the Eclipse 4 platform and to get a basic understanding of several additional technologies in combination with the platform. As we don’t want to start every future blog post with setting up the basics, we start with the basic recipe. In our case this means to setup the recommended project structure and explain the very basics. So the following blog post can also be seen as Getting Started with Eclipse 4 without the typical Hello World approach. Please note that despite the project structure, not every implementation detail in the basic recipe is considered to be best practice. We will add some seasoning and extend the basic recipe in further extended recipes. 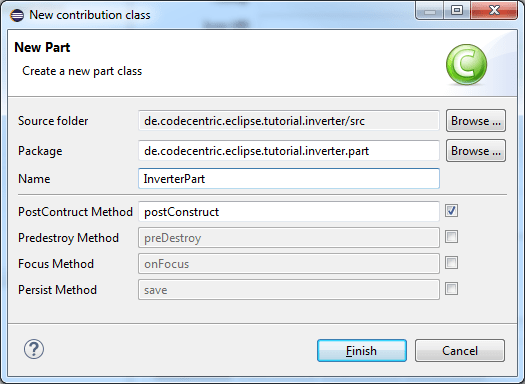 The following steps are personal recommended settings that make working with the Eclipse IDE more comfortable. 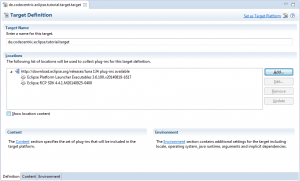 The target platform specifies the plug-ins and versions that are used to build and needed to run an Eclipse RCP application. 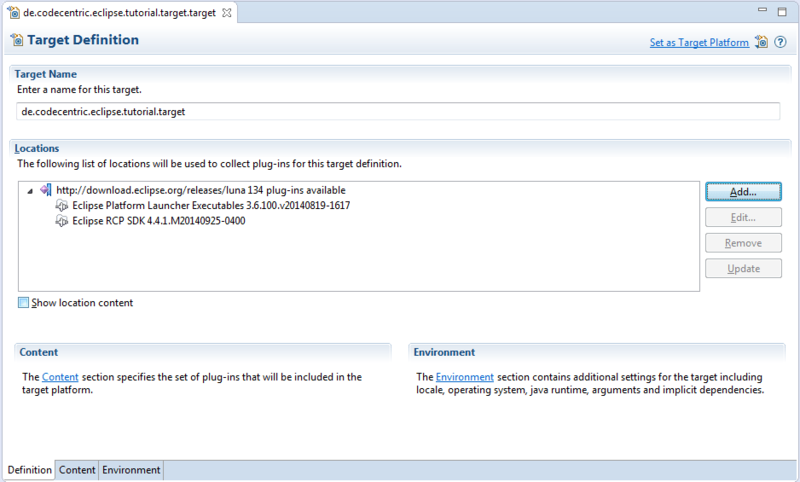 If no target platform is specified, the current active one is used, which is the Eclipse IDE you are working with. As an application shouldn’t update when the IDE is updated, you should always specify and implement against a concrete target platform. The Target Definition should look similar to the following screenshot after all steps have been performed. The application project is a plug-in project that contains the application model and global application settings, like for example stylesheets. 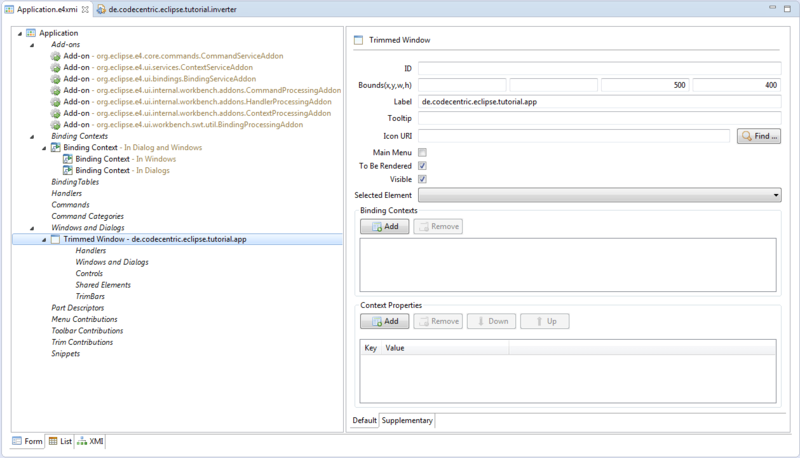 The application model is one of the core parts of an Eclipse 4 application. It describes the structure of an application, including visual elements like windows and parts, as well as non-visual elements like commands, handlers and key bindings. But it does not specify the content of parts or how they are rendered. This way the application model is independent of the UI toolkit implementation. Technically the application model is stored in an XMI file, that is read on application startup. Since editing a XMI file directly is not much fun, the e4 tools project created the Eclipse 4 model editor. 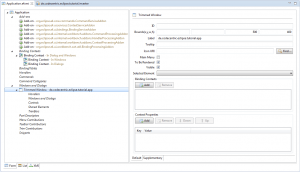 By using the Eclipse 4 Application Project wizard from the e4 tools project, a default application model is created, specifiying the default addons and bindings and a first window to get started with a SWT based Eclipse 4 application. The following picture shows the generated application model. The following plug-in project is used as an example for a content plug-in. It will contain a simple view where a user is able to enter a text and invert it. It anticipates topics like details on the application model, dependency injection and SWT. More details on those topics are covered in later recipes. For the basic recipe simply follow the instructions. The created helper method might look similar to the following snippet. Set the values in the opened dialog. Note that the part implementation will be located in the plug-in project, not the application project! A feature describes a list of plug-ins and other features which can be understood as a logical unit. It is therefore used to group plugins. As the mechanism for updating Eclipse applications (p2) only works based on feature projects, it is recommended to create feature based products (see Step 5). A product is used to tie features (or plug-ins) together into a product together with several configurations. Prevents loading a persisted workbench on application startup. This is very helpful while developing an application, as otherwise changes to the application model would not be shown on the next startup for example. In both cases the application should look similar to the following screenshot. You can also find the complete project setup and sources on GitHub. In the future we will refine this basic recipe to add additional features, and we will also create new recipes by extending this one. Please let me know what you think about this basic recipe. Although I have several recipes in mind, I’m also curious to hear which recipes you would be interested in.